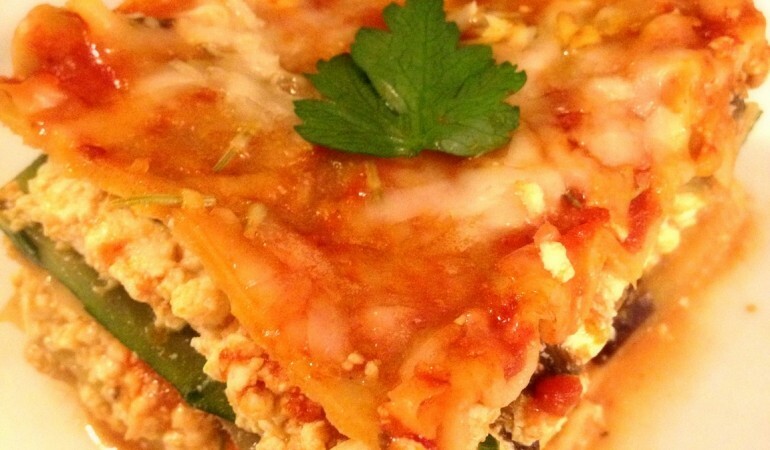 lasagna and provides more vitamins and minerals. It is a very fun recipe to make with children as well. otherwise, pasta sheets can be replaced by more sliced vegetables. 2. Cook noodles according to package directions. Drain hot water out and immerse noodles in cold water. 4. Meanwhile, heat 1 tsp oil in a large saucepan, sauté onion and 1 clove minced garlic in oil for 1 minute. and 1 tsp oregano, and sauté for 1 minute. Set aside. soft, then season with 1/4 tsp salt and 1/2 tsp black pepper. Set aside. paprika, 1/2 tsp salt and 2 tsp black pepper. noodles and tomato sauce. Sprinkle with cheeses. 9. Bake for 40-45 minutes.